Ballinteer Educate Together National School is sharing space with another school, despite having 230 pupils. A principal's old office is being used as a Junior Infants classroom. PARENTS OF A Dublin primary school are looking for answers ahead of the end of this current year and a move to another temporary site. Ballinteer Educate Together National School has been operating out of classrooms in St Tiernan’s Secondary School in Balally but its rapid expansion has meant it must now move. 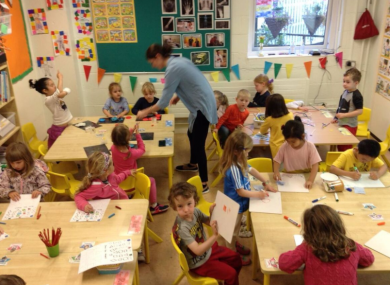 At present there are nine classes from junior infants to third class comprising about 230 children. A parents’ group has said the current facilities are inadequate with resource teachers forced to work in the lobby and caretaker equipment being stored in toilets. Amanda Bailey, head of the PTA and parent of a child at the school, says the size of the classrooms at the current site are too small, but too many questions remain about the new plan. “We knew we were moving and we were happy to get out of the 34 sq metre classrooms,” she told TheJournal.ie. The new building has 80 sq metre classrooms so we were happy to get more space and we thought it was positive, but we don’t know what way they are dividing up the space. The school is to grow next year with two extra classes, making 11 in total. Plans have been previously submitted for the construction of a permanent school building beside St Tiernan’s but these plans were rejected due to access concerns. Updated plans were also submitted but were also refused and there have been suggestions that lands could be purchased by the Department of Education to help with access to the site. The problems have meant that the permanent plans have stalled with the school now moving to another temporary site at Notre Dame in Churchtown. That school campus will be shared with a secondary school and parents have expressed concerns about space at the new school. The parents’ group says the principal of Ballinteer Educate Together National School has yet to even examine the new facility. Instead, parents are waiting on an assessment of the new site to be carried out by the department. Parents will be holding a demonstration at the Dáil next Tuesday in an attempt to put pressure on the department to find a solution. The main issue they want addressed is to be given a timetable for the construction of the permanent school next to St Tiernan’s. A number of politicians have been acting on behalf of the parents and, in response to a question from Senator Neale Richmond, Education Minister Richard Bruton said the school is a “high priority” for the department. The minister said the Notre Dame site was purchased by the department and a technical assessment is currently being carried out with regards to how best to accommodate Ballinteer Educate Together. I can assure the Senator, from our point of view, that this is a high priority. We want to facilitate this successful school. We want to complete these processes as quickly as possible but we have to do them in a way that meets the requirements and expectations of pupils for the long term, and that is a very important consideration. Email “'It's not fair on our children - one classroom is so stuffy it's nicknamed the headache room'”. Feedback on “'It's not fair on our children - one classroom is so stuffy it's nicknamed the headache room'”.